It’s sometimes argued that the future of classical music resides not with large orchestras in grand halls, but with flexible chamber ensembles in versatile venues. 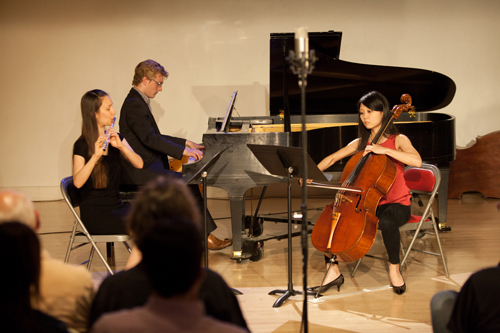 A convincing example of that possible future occurred at Chicago’s Constellation on June 20 in the penultimate concert of the fresh inc 2015 chamber music festival. Constellation is located in a drab brick building that’s indistinct from the industrial structures surrounding it on a particularly lifeless stretch of N Western Ave. With their lack of a raised stage, the venue’s two smallish performance areas allow for intimacy despite the exposed pipes and a mélange of folding chairs. And you can easily interact with performers at intermission or after a concert as you sip a drink from the bar in the entrance area (said drink is also permitted to join you in the performance areas). 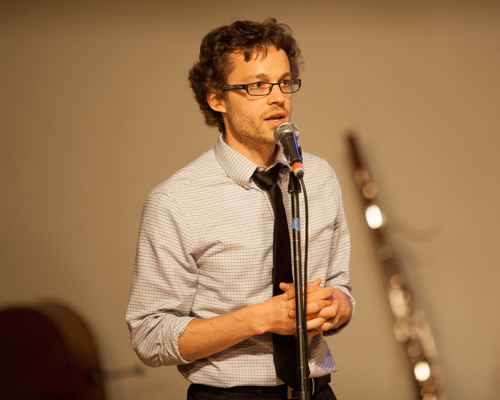 The concert at Constellation was the eleventh of twelve fresh inc concerts given in Chicago, Milwaukee, and Kenosha over two weeks. 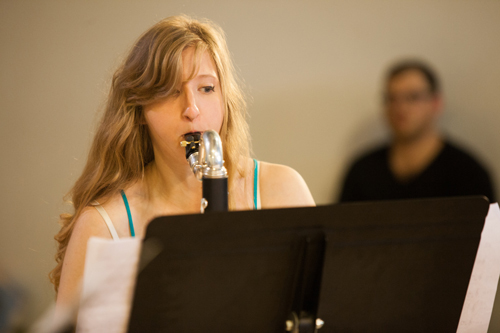 It featured eight freshly inked compositions by participating composers, performed by students and members of Fifth House. Eschewing another trapping of traditional classical music, program notes, each composer verbally introduced their own piece. Several of the composers attempted to depict a philosophical dread, a feeling probably heavy on the minds of these twenty-somethings preparing to leave school in the next few years and make a living. Carlos Bandera’s Tetractys for flute, clarinet, and bassoon fluttered with anxious oscillations that slowly crawled to a screeching peak. Before Death, by Ábel Esbenshade for oboe, bassoon, and clarinet, was saturated with chromatic slitherings that eventually led to a macabre dance à la Stravinsky, with impressive interplay between melodic parts. Existential angst pervaded William Kenlon’s Park Bench at The End of the World. Shadowy chords spread amongst cello and bass were given an eerie tinge by the massive and breathy contrabass and bass flutes, while oboe and viola traded angular phrases. Turner, Rocket, Fire Wheel, by Yuting Lin for two clarinets, oboe, English horn, bassoon, and horn, was similarly sorrowful, with interlocking chains of suspensions. But the anguish melted startlingly into a happy-go-lucky tune replete with bubbling from the clarinets, only to be dispelled by the earlier, pained music. Two other pieces explored the more peaceful side of the philosophical spectrum. 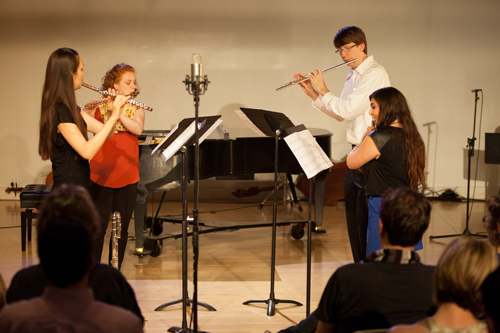 Rachel Epperly’s flute quartet Time Arrives was inspired by fluid conceptions of time, the sylvan frolicking of the flutes evoking Pan’s pipes. Devotion, by Jonathan Russ for piano, flute, and cello, began with meditative humming and floated through spacy, calming harmonies. The combination of clarinet and percussion generated interesting juxtapositions in Sarah Grace Graves’s mercurial Beets. The concert closed with Reaching | Falling by Justin Rito, a commentary on gun violence in America. Rito’s grandmother was killed in a shooting, and his writing for violin, viola, cello, and bass alternated between intense violence and sincere attempts at consolation. With venues like Constellation and musicians like those of fresh inc, it’s not hard to imagine that this is, indeed, the future of classical music. Photos courtesy of fresh inc. Top: Time Arrives by Rachel Epperly. Published on ClevelandClassical.com June 30, 2015.